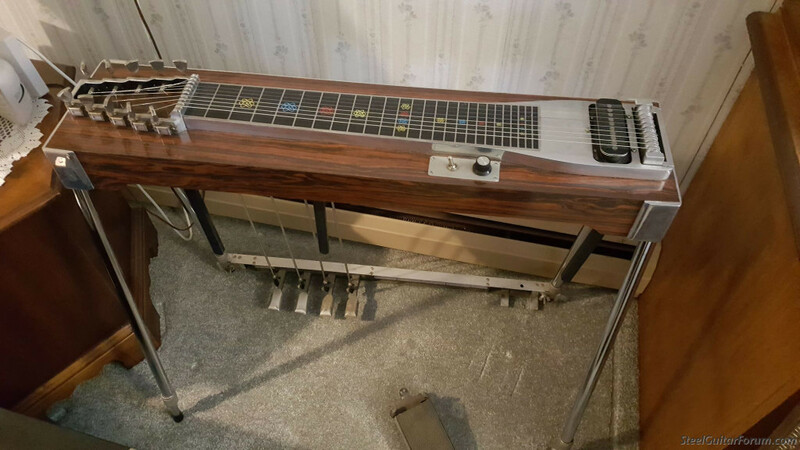 I'm new to steel guitar (coming from 6 string) and now have my grandfather's Emmon's Push Pull S10 with 4 pedals and 3 knee levers (from the original build). I'm looking for a shop or anyone with experience to help show me the process of adjusting and tuning. I am a little nervous to start messing with the pedal and knee lever adjustments too much without understanding how everything works. I tuned the keyhead but the pedals are a bit off. It took me hours to set up the raises on pedal A to the Jeff Newman tuning chart and I really question if i'm doing it right. I am more than happy to pay for someone's time and will travel an hour or two, but I do not want to ship it, and would really value learning how this all works. the emmons push pull is not for the faint of heart in terms of diy set up. it works quite differently than most pedal steels, and embraces the law of unintended consequences. you can start by ordering clem schmidt's book on setting up the push pull. tommy cass is in western mass. and does great work and is a really nice guy. john widgren also has a great reputation and is in connecticut. either one i'm sure would give you a great setup in less time than you could do it yourself. steel guitar is hard enough to start on, but is even harder if you don't have confidence that your machine is working correctly. Forum member Burnell Groft in Hanover can do it. He has rebuilt many steels. I don't have his phone number. Tommy Vollmer in Hamburg Pa. can help you. I'll ask him to contact you. I am in Hamburg Pa and can help. Thank you everyone for the replies. Tom - I just sent you an email. Your doing the right thing. I've played all pull PSG's for 40+ years. Got my first Push Pull a couple of years ago and they are a strange and different animal, but a very nice pet to have. It's a very simple system that is very difficult to set up right. Once set up it stays put for a long time. They seem to stay in tune very nice too. I had some help getting mine working right by people who know. Even now, I'd not want to mess with it though I've worked on many all pulls, this is a different world. I'll bet that will be a great sounding steel and enough to keep you busy for years to come. I'd highly recommend Clem Schmitz's bargain-priced booklet "Methodology And Practice In Pedal Steel Guitar" to any Emmons push-pull owner. Clem used to own a steel guitar store and repair shop in Minneapolis, then one in Nashville, where he worked on Emmons push-pulls owned by players such as Mike Johnson. The 24-page booklet shows how to make simple adjustments to an Emmons push-pull or even take the entire guitar apart and put it back together. In his booklet, Clem explains step by step (with photos) exactly how to disassemble, re-assemble, and adjust push-pull guitars with several clever little tricks that would take a very long time to figure out. He usually sells the booklet on eBay listed as "Pedal Steel Guitar Methodology P/P Guide Booklet" for $15. 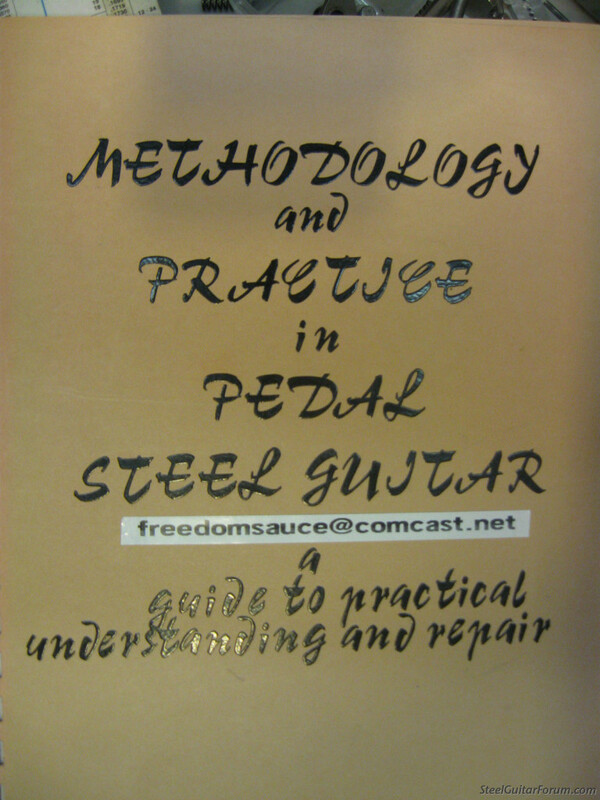 He also sells a combo package of the book and 2 DVDs as " Pedal Steel Guitar METHODOLOGY P/P Book & DVD's Package" for $20. I'd recommend the $20 "combo package". Emmons push-pull guitars are very reliable and stable and I almost never need Clem's booklet, but it’s great to have for the rare time every 10 years or so when some little Allen screw loosens up somewhere, or a string pitch change isn’t happening the way it should—and you have to leave for a gig in the next 30 minutes. Clem is a very helpful guy; I've heard that if you are really stuck, he will guide you through the fix via Skype for a very nominal fee. +1 for Clem. He has helped me over the years both with set up issues and with supplying some of his special self made parts. His Methodology book is my bible for my push pull. Posted 17 Apr 2019 3:24 pm The good book! I saw your posts and just went right on line to order "The Good Book" Ha ha ha. Looks like a good help with Push Pulls. My 2 cents added to those above who are definitely very knowledgeable. A push-pull that is well adjusted will rarely require readjustment, especially if one stays with the same string gauges. Yes, minor tweaks to individual strings are necessary but it has been my experience that push-pulls stay amazingly in tune. I don’t know how many times I have set up a p/p for a gig, sat down to tune and discovered the steel to still be in tune.